A modern three bedroom property situated in the popular residential location of Bletchley Park. Ideally located for easy access to Bletchley mainline train station. 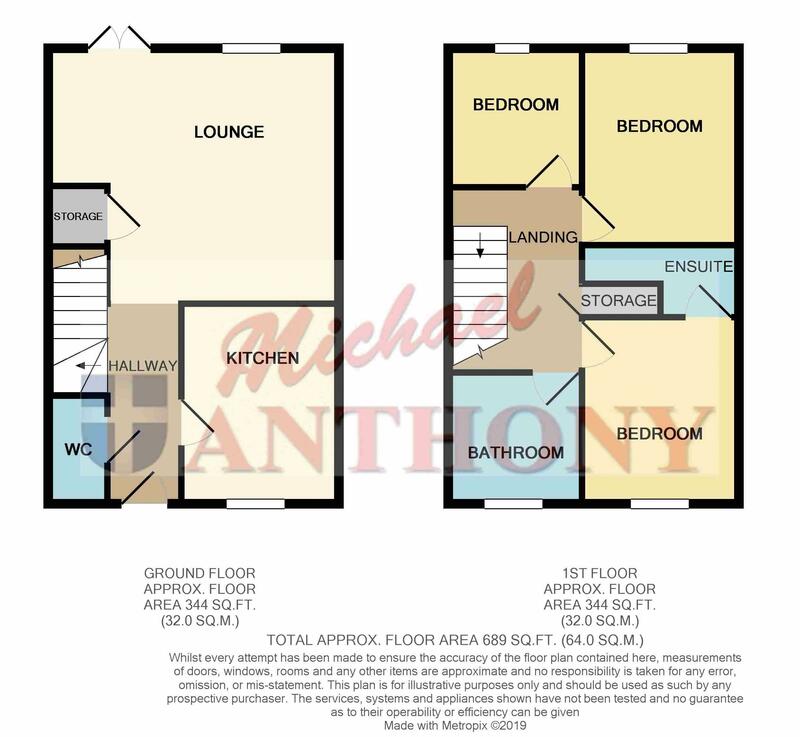 The accommodation briefly comprises entrance hall, cloakroom, fitted kitchen, lounge, master bedroom with en-suite, two further bedrooms, bathroom, allocated parking, front and rear gardens. Slabbed footpath to double glazed front door with storm porch over. Wash hand basin, tiled splash back area, low level wc, laminate wood flooring, radiator. Double glazed window to the front, radiator, inset spot lights to ceiling, fitted with range of storage cupboards at base and eye level, rolled edge work surface areas, one and a half bowl sink unit with mixer tap, plumbing for washing machine, integrated dishwasher and fridge/freezer, fitted gas hob with filter unit over and oven under, extensive complementary tiled surrounds, ceramic tiled floor, telephone point. Double glazed window to the rear, two radiators, coving to ceiling, central fireplace with wooden surround, mantel and fitted gas fire, door to storage cupboard, twin double glazed french doors to rear garden, television and telephone points. Access to loft space, coving to ceiling, door to airing cupboard housing hot water cylinder and shelving, doors to all rooms. Fully tiled walk in shower cubicle with fitted shower, pedestal wash hand basin, low level wc, heated towel rail, inset spot lights and extractor fan to ceiling, shaver socket, tiled splash back areas, laminate wood flooring. Double glazed window to rear, radiator, coving to ceiling, television point. Double glazed window to the rear, radiator, coving to ceiling. Frosted double glazed window to the front, heated towel rail, white suite comprising panelled bath with shower over, pedestal wash hand basin, low level wc, laminate wood flooring, complementary tiled surrounds, inset spot lights to ceiling. Three allocated parking spaces at the rear of the property. Lawned areas, flower and shrub borders. Slabbed patio area, footpath, lawned area, rised flower borders, enclosed by timber panel fencing, gated rear access, garden shed.